Bushman Equipment, Inc, a manufacturer of custom-engineered material handling solutions, has delivered a special Below-the-Hook Roll Lifter for one of the world’s leading manufacturers of tissue. 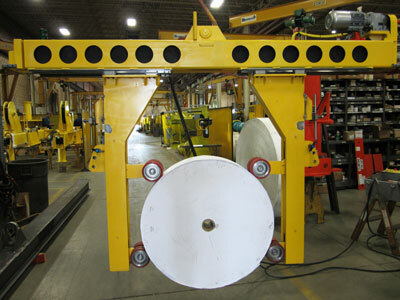 Bushman® spreader beams, C-Hooks, paper clamps and tongs are most often used for roll handling. However, this application was different and required a piece of equipment Bushman had never built before due to several engineering requirements. The diameter of the rolls being lifted would vary and the widths could be wide-ranging, necessitating adjustments on the fly, in addition to the roll being cradled around its OD. Bushman designed and manufactured a motor-driven roll lifter featuring quick release pins allowing for adjustment and accommodation of the different diameters. Capacity of the roll lifter is 1,800 pounds with dimensions of the rolls measuring between 7” to 16” wide x 36” to 72”in diameter.